Hello Friend! Russian doom scene is very strong just now, but unfortunately… you’re not really known here in Czech republic, so could you please introduce your band to our readers ? How do you view the response to your music outside Russia? Hello! Thanks for your interest! At the end of 2003, I felt the need to express my accumulated musical ideas. The first demo was published in April 2004, and reissued with amendments in 2005. Then came the material implemented in the demo of 2007, and in 2008 I put together a full team. 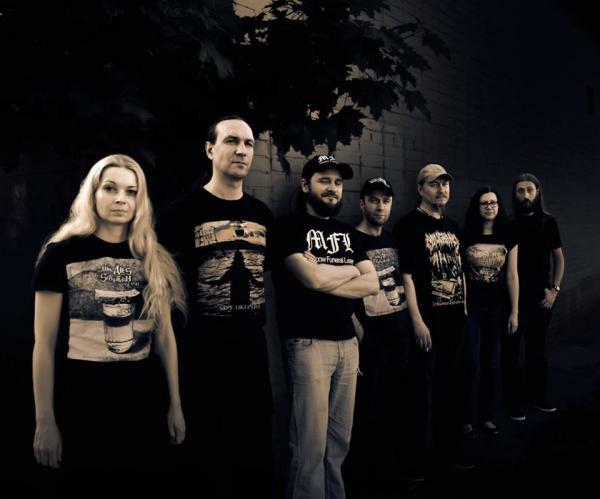 As of December 2014, WHO DIES IN SIBERIAN SLUSH includes seven experienced musicians, and the band has to its credit two full-length albums and a split CD. We intermittently perform live, working currently on the new material. You came up with a beautiful name. How did you decide on WHO DIES IN SIBERIAN SLUSH? Thank you. I was born in Siberia, which is only one of the many places in Russia, where talented people pass away without an opportunity or time to fully express themselves. WHO DIES IN SIBERIAN SLUSH is somewhat homage to certain people. And not only for me. How can you describe your musical style? Our team assumes that we’re playing funeral death doom – music at the junction of death doom and funeral doom. This choice has been conscious, in our opinion, it is the most expressive musical way to translate our perception of reality. How are the general feedback for „We Have Been Dead Since Long Ago…“ so far? What has the media reaction been like so far to the last record? I can form my view about how things are with the album only through the coming reviews. In Russia, it has been less understood than, for example, in Europe. But we got a big number of reviews, and their overwhelming majority are positive. How do you view last album in the grand scheme of band’s progression over the years? Despair, impuissance, protest and uneven hopeless struggle of a person against circumstances, and death of the person as an outcome. But death does not mean anything, as we have all been dead since long ago. This is the canvas of our second album, “We Have Been Dead Since Long Ago”, consciously came off to be more experimental and “prickly”. Each week we get feedback from the audience from different places around the world. And I believe what this album played its worthy role in the band’s history. The lyrical theme of the band is about Siberian nature, abstract dreams, alcohol, depression… Can you describe the pictures you want to figure out with words ? As far as I know, there is no description of Siberian nature, alcohol or depression in WHO DIES IN SIBERIAN SLUSH’s lyrics. I don’t know who gave such characteristic ))). I think that the lyrics of WHO DIES IN SIBERIAN SLUSH are united by feelings of a man whose soul is frozen over with an endless severe winter of man’s inner world. Man stuck in his own endless winter… Partly it is reflected in the texts, some of them based on my literary works. Partly it is reflected in the music, as I think. Do you compose music first and then the lyrics or is it the other way round? It happens in different ways. But most often, the music and the theme of the text appears at the same time. How has the internet influenced your musical career and the promotion of your music? I think the internet played some positive role in the promotion of all modern bands. But, as it seems to me, on a global scale it will be the internet that will eventually bury the release of CD’s and with that most of the labels. Such will be the main influence that the Internet will have on all groups. And we will not be an exception. Yes, we have a new material. Until the end of 2014 a split album of WHO DIES IN SIBERIAN SLUSH in conjunction with Finnish/German funeral/death doom band MY SHAMEFUL will be released on MFL-RECORDS. Now it is the period when I feel the need for the implementation of highly hindered death doom, heavy and low-sounding, completed with wind instruments. Perhaps, the implementation of the horn section concept in the future will be realized. Also we have very real plans about full-length album in 2015. Follow the news http://wdiss.com/ Join our communities in the social networks. What have you been listening lately? Do you have any favorite bands that you listen to right now? Who do you feel is the most talented band in the doom metal scene? I follow all new releases of doom-metal, and continue to be an ardent listener, buy discis and merchandise. My favourite ones are: COLOSSEUM, LOSS, AHAB, MOURNFUL CONGREGATION, ATARAXIE, MOURNER, LONGING FOR DAWN, EYE OF SOLITUDE, TOWARDS DARKNESS, WORSHIP, RECLUSIAM, MARr DE GRISES, MOURNING BELOVETH, and MY SHAMEFUL. I can not single out some of the bands, each of them is unique in its own way. What about WHO DIES IN SIBERIAN SLUSH and live performances? How often and under which circumstances are you playing live? We perform rarely, but right on target, and seldom leave Moscow. We are open to offers of performing outside the country. But frankly, we’re skeptical about the prospects of such trips – we are an anti-commercial band, making money on our performances is an unlikely thing to do. So, last question… Can you introduce Moscow Funeral League and their community? As usual, you have the final words… Thanks for your time and answers! Thank you for the interesting questions and the opportunity to share my thoughts with people! I actually have some traditional words to say: stay true to yourselves!